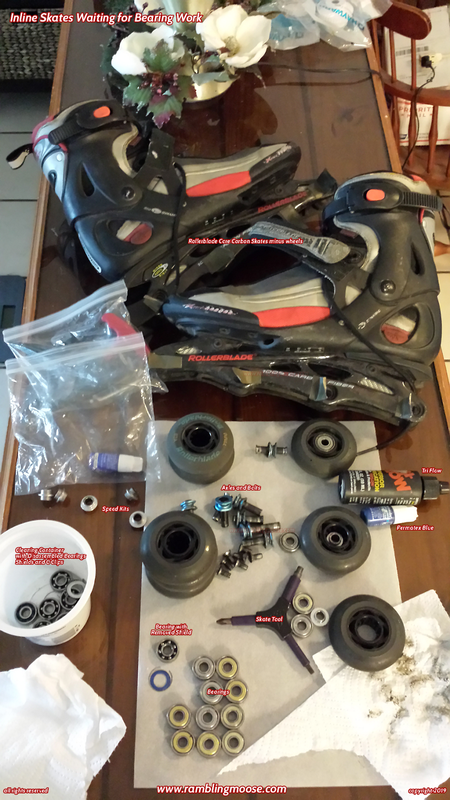 matter what they are in, wheels, skate wheels, or other purposes, they need maintenance. I have a lot of leftover bearings from when I competed and skated 100 mile weeks like they were going out of style. That means that in Peak Season, I would be tearing down inline skate bearings once every two weeks. I have plastic Feta Cheese containers with lids that has my old inventory, and I am going through them. Just before I left Philadelphia at the end of the 2005 season, I tore down every one of those couple-hundred bearings and refurbished/restored/reworked them. Lubed and ready they sat in the Feta Cheese container until I needed them last week. The problem is that an oil will oxidize if left alone long enough. That was what happened to me. 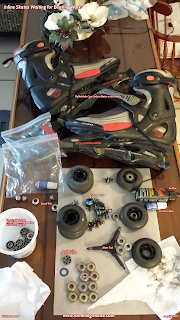 I found that they slowed me down greatly, and trust me, all those 21,000 miles worth of skating meant I was tearing down a lot of bearings so I know how they should feel. The good news was that when I did this process to my old bearings from years past, I used them today. The process shaved a whole minute off a mile, so it's worth it. To do this, I use the following - your process may vary. Electric Hair Dryer with a flat metal grid over the heating surface. Plastic container for bearings and parts of bearings. A "sturdy" push pin with a fine point. A container of lubricating oil. I use Triflow and have for decades. A Skate Maintenance tool - has a pusher to remove a bearing from a wheel and a hex key. Understand this is a long process. Doing this from start to finish for me took 3 hours on a rainy sunday afternoon. Once you start, you really do have to complete the process by getting the bearings lubed and sealed up once again. Take A Deep Breath, You Can Do This! Keep in mind though, this process is for UNSEALED bearings. These are bearings where the shields can be freely removed. 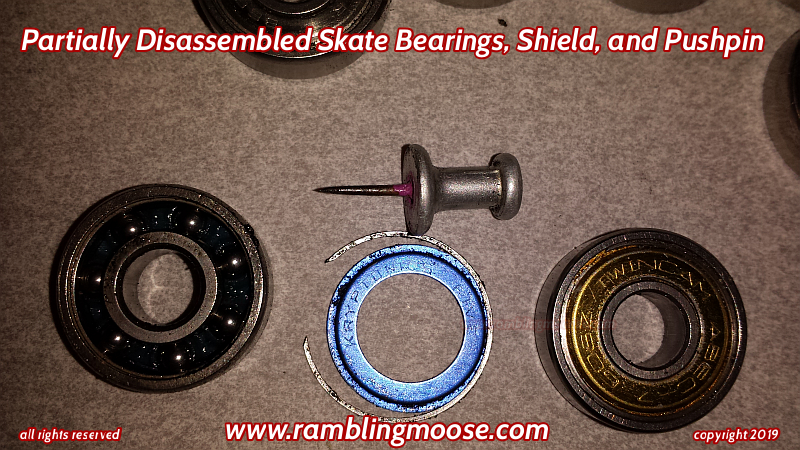 If you can't remove the shields and get at the insides, you're done, buy a new set of bearings. Come on back when you have got them. Standard Internet Warranty applies - this is at your own risk. If you ruin your bearings, well that's on you. I have made every effort to present this in excruciating detail to be as complete as possible by a knowledgeable amateur. Ramblingmoose.com takes no responsibilities towards anything that you do as a result. Sorry, but weasel words are here to protect ... me. First step is to remove all wheel assemblies from the skate "truck". Since there are variances in how this is done, I'm being general. Find the screw or bolt that holds it in, remove the bolt from the wheel, push the axle through the wheel to free it, and set it aside. Second is to remove all bearings from each wheel. This gets you to where you have naked metal parts - bearings, axles, and bolts/screws. Use your skate tool to push the speed kit or anything else in the way out of it. That should pop the bearing out from the other side. If no speed kit is used, then you can use the skate tool to seat inside the center of the bearing, lean it toward one side and pull back to extract the bearing. Third, with a clean towel wipe all old grease and grit from the outside of the bearing. I do mean ALL. There is a track on the top of each bearing that must be visible so that you can see the retaining clip. Fourth, Completely Disassemble each and every bearing and place all parts in the cleaning container. I will go into detail after I complete this long process. See below. No really, go to the bottom of the article where I describe everything in painful detail. Fifth, Add Citrus Degreaser to the cleaning container and water if you feel you need it. I use full strength. Sixth, Cover the container and shake it vigorously for enough time to degrease the bearings. I usually take more than a minute shaking this up inside the sink. Seventh, Pour off the solution and cover the bearings with tap water. Shake it vigorously. Your water will discolor. You will see grit get dissolved into the water. You may wonder why you even started this longish process. Eight, Repeat step Seven until the water runs clear. It took me six repeats. Nine, lay out paper towels. Bang out the bearings on the paper towels until there is no more water inside the bearings, visibly. Place each bearing on a dry paper towel. Repeat with the shields, bolts, screws, C-Clips, and so forth until everything is as dry as possible. Ten, Using the hairdryer, place each bearing on the grid on the outflow or hot side of the hairdryer. I tend to put down more than one because this is a long process. Turn on the hairdryer to full hot and allow the air to dry the bearing completely. All water must "bake out", because any water left in the bearing will rust it. I repeat - all the water must bake out because any water left in the bearings will rust them. Go longer than shorter. 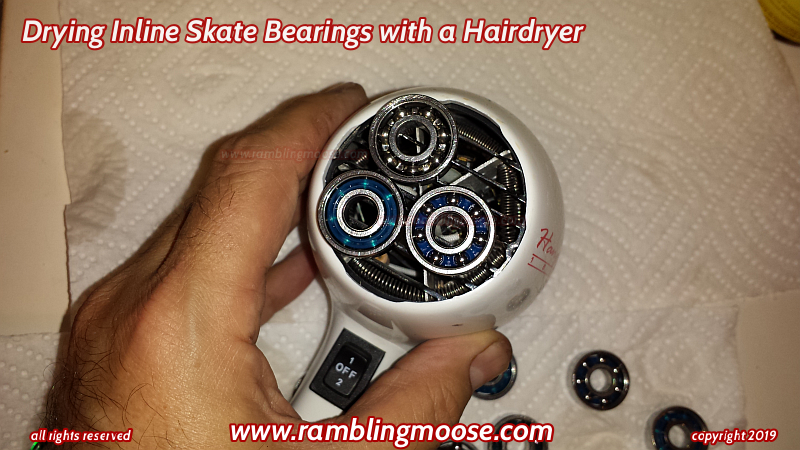 I find a minimum of 1 minute per bearing is needed with my hairdryer, your time will vary. Eleven, partial reassembly. Place one shield in a bearing. Replace the C-Clamp by fitting it in the groove toward the outside of each bearing. Repeat for each bearing, but only one side. Twelve, Lubricate the bearings. Tri-Flow has a drip applicator where you can get a single drop of oil if you squeeze gently. Each bearing needs three drops of oil. Spin it gently. Replace the Shield and C-Clip for the opposite side. Spin the bearing. It must spin freely - Tri-flow is a speed lubrication oil (or so I was told once upon a time). The bearings should spin like a fidget spinner. Repeat for every other bearing you have. Finally reassemble the wheels by pushing one bearing into place, inserting a speed kit where they came from, and place the second bearing on the opposite side. Once that all is through, you can bolt each wheel into the skate truck and test for speed. If a wheel is bolted too tightly, it will stop spinning quickly when spun. They should be free, and the bolts should not come loose. I use a small square of duct tape and a little "Permatex Blue" to put the retention bolt in place and keep it there under load. Ok, now that the "general" (yeah right) process has been described, the complete teardown. All bearings are laid out in front of you. Take a bearing, and look at it from the side. It looks like a ring or a donut. Under the outer ring, there is a notch where a piece of flat springy metal sits. It's in the shape of a Letter C.
The ends of the C are beveled where one side is beveled away from the rim. That creates a notch where you insert the tip of your push pin and pull it away from the rim. The C Clip should pull away "easily", but you may find that some refuse to come out. If all of your bearings are like that, you have sealed bearings and you can not or are not able to pursue the disassembly, and you will want to reassemble the wheels without washing them. If the C Clip pulls away, set it in the cleaning container. Under the C Clip there sits a circular metal shield. It looks like a flat washer but is typically rather thin. This has to be removed, and it should fall right out with a little coaxing. I use the push-pin to get one side up then flip it upside down to get it to fall out. It should not bend or be bent. Wipe down the shield and C Clip and place them in the cleaning container. You should now be able to see the ball bearings and the guide that holds the ball bearings in. The better bearings have a metal guide. The plastic or teflon guides are useable but will degrade with time and re-lubing. Not a crisis since new bearings are fairly available. Now that you have removed both Shields and C-Clamps, place all parts in the cleaning container and move onto the next bearing. When all bearings are done, go back up to Step Five since you are ready to actually degrease your bearings.